All three vowels there are the letter “o” by the way, but in Russian, only one O per word can be pronounced as an “oh.” The rest sound like “uh”. Alright. As those seep into your sub-conscious, let’s review the material from podcast 6. Здравствуйте, я буду кофе, пожалуйста. How should you thank him when he brings it? Now wait a second. What does пожалуйста mean? Please or You’re welcome? Well, hopefully you recall that it literally means ‘please’, but it’s also used as a response when someone thanks you because you’re telling them PLEASE…there’s no need to thank me. How will he say: Yes, this is pasta. I’ll have the pasta, please. Did you remember to say “pastu”…with an “uu” sound at the end? Remember, by ordering pasta we’re doing something to the word. And so its “ah” ending has to change to “uu.” If you’re still shaky on that, it might be worth reviewing the previous podcast, number 6. But if you got it right and said pastu, honestly, you’re doing great! So, do you recall those two words we started the podcast with? Let’s see if you can figure out what they mean. Хорошо. Я буду Хайнэкэн, пожалуйста. Хорошо. Я буду Спрайт, пожалуйста. Awkward sounding, for sure, but important to know. And what about that other word, хорошо? Well, that can translate a number of ways. In these examples it’s used like the English word “okay”. You wanna go to the movies? The word has other uses and meanings that we’ll pick up as we go along…хорошо? Да. Есть борщ и есть солянка. So, she said: Yes, there is borscht and there is solyanka. I’ll have the borscht, please. Did you remember to change the “a” at the end of solyanka to an “uu” sound? solyanku. Да, есть. И есть капучино. Okay, I’ll have the cappuchino, please. Хорошо. Я буду капучино, пожалуйста. So, we say yogurt, and in Russian it’s йогурт with that deep “uu” sound. And that 2nd one is muffin. They have a “mah” sound at the beginning. And for that, envision a bluberry muffin, or some other sweet muffin. Think cakey, not bready. There’s coffee, there’s yogurt, and there’s a muffin. Есть кофе, есть йогурт, и есть маффин. So that’s the tip of the day: From time to time, ask questions you already know the answer to. Gulp! Well, don’t panic. She used a different greeting: Добрый день. And then she followed with: Что Вы хотите? …as she pulled out her pad and pen. So, ЧТО is the Russian word for “what”. So when the waitress pulls out her pad and pen and asks Что Вы хотите? Yes, there is. There is borscht and solyanka. Да, есть. Есть борщ и солянка. Okay, I’ll have the borscht, please. And coffee. Хорошо. Я буду борщ, пожалуйста. И кофе. No, I’ll have the solyanka. And she says: You’re welcome. We know he’s asking, WHAT….something something. I don’t want to officially learn this phrase yet. We’ll cover it in a future episode. For now we’re just going to assume he’s asking: What do you want? А…завтрак хотите. Ну…есть йогурт, есть маффин, есть блины…и есть кофе и капучино. You’ll notice this happens a lot with any foreign language you learn. Native speakers never seem to use the exact phrases you’ve studied. Of course, why would they? The assumption by native speakers is essentially: Well, he knows those words, so he must know these words, too. есть йогурт, есть маффин, есть блины…и есть кофе и капучино. There is yogurt, there is a muffin, there are blini — blini are those are thin Russian pancakes, basically like crepes — and there is coffee and cappuccino. Okay, I’ll have the yogurt, please. And cappuccino. Хорошо. Я буду йогурт, пожалуйста. И капучино. How does he say: You’re welcome. If you’re comfortable with this kind of exchange, you’ll do great when you visit Russia or Ukraine. Sure, there are tons of foods that we haven’t covered, but there are also so many cognates when you’re dealing with food, it’s easy to get by. Here are six food cognates off the tip of my head. Can you recognize each one? Listen..
We could go on forever with food cognates. So don’t worry. When it comes to ordering in a restaurant, you’ll do great. I’ve moved the link to the Read Russian Videos to the sidebar on the right. Check out the Read Russian in 3 Hours links. You can get the free app for i-phone, or Android, or watch the videos online in your browser if you’d like. how. I will try to get someone to help me out. Sorry…Will definately try to get help. Wanted to say that this is one of the best learning tools I have come across, and I’ve tried many. You really understand intuitively how the brain learns, and I appreciate the intuitive approach to learning grammar versus studying complicated abstract terminology. I think the problem with most language learning software or audiotapes, is that those who have created them are linguists, and assume that the readers are comfortable in the same ecosystem of terminology as they are. -For myself I don’t listen to the audio here, I find it stressful to try to keep up, and/or have to pause and unpause constantly. Instead I read only the transcripts. It would be helpful to possibly not use the cursive forms for certain words, as anyone learning Russian probably has just focused on the standard alphabet and the cursive can be confusing. -It would also be helpful in the transcript section were the answers/replies hidden, requiring a click to reveal them. As it stands I have to keep a second window open to use to cover the answers, as I attempt to think of them. Thanks again for providing this enormously valuable learning tool. Thanks for the comment. I totally agree: Most other courses (and especially Russian textbooks) are created by terminology-obesessed linguists who seem to have no clue how we actually learn languages. I would strongly recommend that you go back to listeing to the podcasts instead of just reading the transcripts. Pressing PAUSE all the time is good: Gives you some exercises (ok, kidding there)….But it does keep you listening actively. And most important, you’ll hear all the native speakers we use. Thanks again. 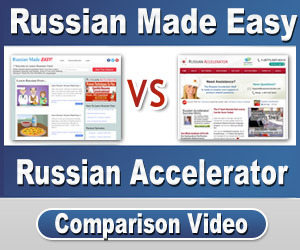 And maybe we’ll see you in my video-based ‘Russian Accelerator’ course. it’s fun for me to follow your lessons, I enjoy them very much. As you can notice from these words, I’m not even a decent English speaker, so it’s a double task! 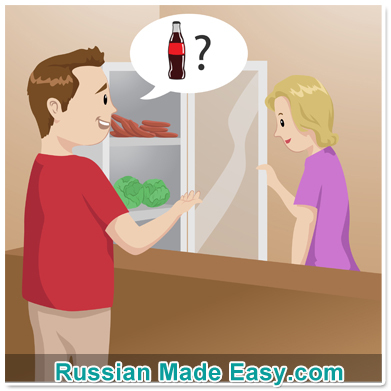 Anyway, ‘Russian Made Easy’ is great! I discovered it less than a week ago, and I’ve just finished Episode #7. Please tell me: #30 is REALLY the last one? Yes, #30 is the final podcast. But the teaching doesn’t end there. It’s really just begun. I hope you join my Russian Accelerator course. It’s all video based, which is much more effective. Curious why cuppuccino doesn’t change from the oh to the uu when ordering? капучино is not a feminine noun (it doesn’t end with an ‘а’ or a ‘я’. Only feminine nouns change in that way. Wow! Spasibo bolshoe for the kind words. I love your enthusiasm. I think you’re going to do great in the podcast and in the language in general. Please let me know how you do on the final exam (Podcast #30). Hello, I have a question regarding the -а to -у change when doing something to a feminine noun. In a reply to another comment, you said feminine nouns can end in -я as well. When doing something to a noun that ends as such, would it retain the “y”(<-english y) sound and be changed to -ю? Or would the last letter still be changed to -у? I also want to say thank you so so much! These podcasts have helped me make more progress in three days than I could have made in weeks using any other system. Thanks a bunch. Great question, Milo. Yes, the Я ending of feminine nouns change to Ю when we do something to the noun. Hi Mark! thank you very much for sharing your knowledge of Russian language and make the lessons as didactias and fun. I learned a lot in a short time and would like to learn even more. Great questions, and I’ve just sent a lengthy reply via email. laying down the fundamental patterns. R.A. then greatly expands on them. And by using video, R.A. can do much more, and more efficiently, than the audio-only format of the podcasts. I am there from your app for learning Cyrillic, which did a great job. I learned english by myself but it took years to reach there, but with your method, somehow i don’t forget anything after learning it, this is by far the best learning approach i’ve ever seen.